Obama dismissed “a notion of [American] strength that is defined by opposition to old enemies, perceived adversaries, a rising China, or a resurgent Russia; a revolutionary Iran, or an Islam that is incompatible with peace.” Yet he spent the bulk of his speech addressing these threats in a way that seemed based more on hope than on method. On a rising China , he said the United States doesn’t “adjudicate claims” in the South China Sea, and prefers “resolving disputes through international law … while encouraging China and other claimants to resolve their differences peacefully.” In other words, his message to Taiwan, Japan, the Philippines andVietnam is, “you are on your own.” It was the worst statement of U.S. interests in Asia since Dean Acheson’s January 1950 National Press Club speech that omitted mention of South Korea and was blamed for starting the Korean War. To a resurgent Russia , Obama said that the U.S. won’t “stand by when the sovereignty and territorial integrity of a nation is flagrantly violated” but quickly flexed, adding that he did not “desire to return to a Cold War.” He tutted that annexing Crimea was only seen as a case of Russian expansionism by “a number of U.S. politicians and commentators.” Not to mention almost everyone in Eastern Europe. “Imagine if, instead, Russia had engaged in true diplomacy,” Obama continued, apparently invoking John Lennon. Well, in that case Russia would not currently control Crimea, which shows us that Russian President Vladimir Putin has a much bigger imagination. 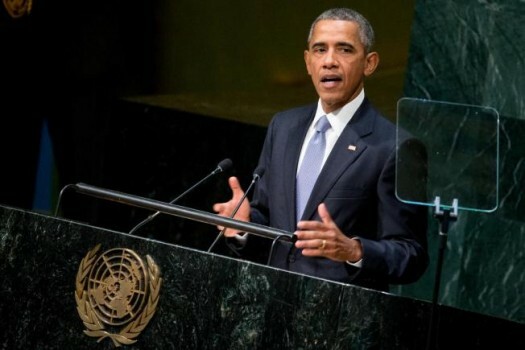 Addressing revolutionary Iran , Obama praised the “lasting, comprehensive deal that prevents Iran from obtaining a nuclear weapon,” which if fully implemented, “the prohibition on nuclear weapons is strengthened, a potential war is averted, [and] our world is safer.” However later, without apparent sense of irony, he mentioned that Iran “as of this moment, continues to deploy violent proxies to advance its interests. These efforts may appear to give Iran leverage in disputes with neighbors,” he continued, but in fact only “fuel sectarian conflict” and isolate Tehran from “the promise of trade and commerce.” Obama seemingly doesn’t grasp that fuelling sectarian conflict is Iran ‘s objective. As for trade and commerce, Iran will have plenty of that once sanctions are lifted under the nuclear deal he championed. “Chanting ‘Death to America ‘ does not create jobs,” Obama intoned, “or make Iran more secure.” He said Iran should choose a different path. However, “Death to America ” – not to mention to Israel and to the House of Saud – is a concise expression of Iranian interests, policies and strategy. If Iran chose a different path, as Obama suggested, it would not be the Islamic Republic. Addressing the challenge of Islamic extremism, Obama got tough, saying there is “no room for accommodating an apocalyptic cult” like the Islamic State group, and the U.S. “makes no apologies for using our military, as part of a broad coalition, to go after them.” But he added that force alone would not create stability in, for example, Syria. There, the people must make a “managed transition” past the era of President Bashar Assad and “forge an agreement to live together peacefully.” This was an achingly bland prescription for a complex, multi-sided civil conflict with international dimensions. Obama’s calls for regime change in Damascus ring more hollow each time he makes them, since theU.S. has taken no dynamic steps to implement this policy. The states most active in seeking to settle the Syrian problem are Russia and Iran , both of which support the regime Obama says need changing. But the president is unlikely to take a strong stand against either Moscow or Tehran, so whatever transition takes place in Syria, Russia and Iran will manage it. The subtext of the speech was Obama knows best. If only countries would stop pursuing what they think are their interests and sign on to his view of things, the world would be a much cozier place. One got the sense that Obama sees himself more a citizen of the world than president of the United States. Maybe he is angling for a post-presidential job as U.N. leader. Maybe he would consider that a step up. James S. Robbins is senior fellow in national security affairs at the American Foreign Policy Council, and author of “The Real Custer: From Boy General to Tragic Hero.” This column originally appeared in US News and World Report.